Gold Bond Mattress is not only known as a superior quality leader in the mattress industry, it is also world renowned for making the finest futon mattresses. Rugged construction ensures long-lasting firmness, loftiness, and support for your futon. Gold Bond's Joy cotton batting fill is the most durable and most dense batting in the world, a process refined by the company for over 100 years. A great selection of futon frames is also available to go perfectly with their futon mattresses. 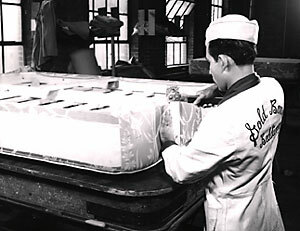 Where it all began: the factory in Hartford, Connecticut where Isadore Naboicheck began building Gold Bond mattresses. Bob Naboicheck, President of Gold Bond, tells customers and employees alike that they are all part of a special family tradition. "Quality and superior service," he says. "It has been and will be our tradition." It is a practice that started in 1899 when Gold Bond founder Isadore Naboicheck began blending his own cotton and making mattresses in a four-story brick building near the Connecticut River in Hartford, Connecticut. Isadore set out to build the region's most comfortable mattresses--a novel idea in times when mattresses were mostly regarded as "lumpy". There were no national mattress brands back then. But Hartford was the richest city in the nation, peopled by the likes of Mark Twain and gun maker Samuel Colt, and host to insurance companies like Aetna and The Travelers. Opportunities abounded, and Isadore capitalized on them. By the end of World War II, Gold Bond was delivering mattresses throughout the eastern United States to private homes, leading universities and posh hotels. In time, with Gold Bond firmly established as the country's largest independent mattress maker, son Aaron "Butch" Naboicheck succeeded his father Isadore. Steel innersprings were gaining prominence and national television advertising promoted "brand name" mattresses. But Gold Bond's commitment to pure cotton and hand-made features never wavered. "It would be easy to take some of the quality out of our mattresses," Butch said in the mid 1950's, "but why remove what makes our mattresses great? We're sticking to what my father started. Our customers expect it." The company continued its growth, and that's when Butch's son Bob became the third generation of Naboichecks to step onto the factory floor. Together, father and son brought Gold Bond quality to something brand new--the modern futon mattress. Originally a thin Japanese mat, Butch and Bob saw that futons in the bedroom, den, office, living room or guest room could be more comfortable and less expensive than rollouts or sofa sleepers. So they made that thin Japanese mat more plush and comfortable. Beginning in the 1980s, futon sofa sleepers took hold, and today they show no signs of slowing down. Today, Bob--along with his son Skip--has ensured that quality and superior service will be as integral a part of Gold Bond's future as it was part of the company's past. "As other companies cut corners, we will continue to do what we have always done best," he says. "It's what sets Gold Bond apart in the marketplace. Whether it's building mattresses or futons, or simply answering the phone and taking care of our customers, Gold Bond is all about exceeding our customer's expectations."